In the words of Queen Bey “you must not know ’bout me” because, baby–I can show you rude if you really wanna see it. I purposefully waited a day before responding because my original response was hella rude. Disappeared for MONTHS after our first date–no phone call, text, telegram, smoke signal, NOTHING. Telling me he didn’t feel like making the drive to see me (after I drove to see him the last time we hung out) and making plans with me, but cancelling the day of because his “night kinda disappeared with a bunch of stuff.” <~~~WTF does that even mean? So, sir–if being up front about not wanting inconsistent people in my life is rude, then I don’t want to be polite. I got back on Tinder. …the one who asked me (before we’d ever met) if I liked to give head. 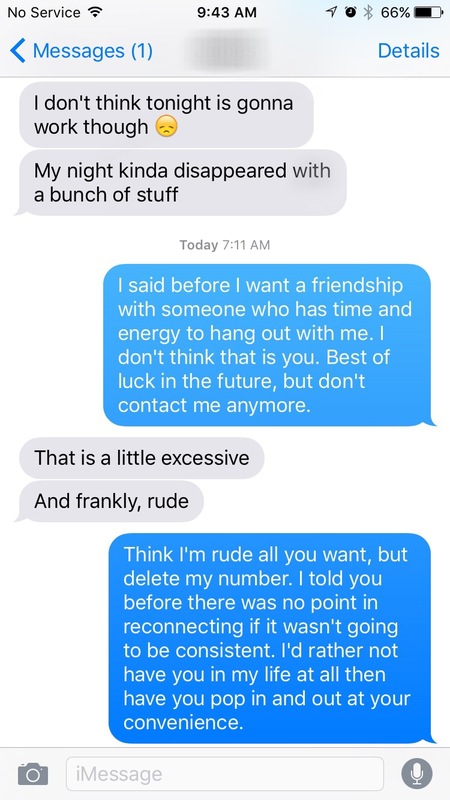 …the one who (after a pretty great date) disappeared for five months, then tried to come back into my life only to be too busy to spend time with me. …the one who (again, before we’d ever met) called me damaged because I refused to cosign on his claim that he was the best thing that ever happened to me EVEN THOUGH I HAD NEVER MET HIM. He claimed I was “choosing a Buick over a Bentley” (whatever that means). …the one who sexually harassed me, then bashed Black women (a.k.a. women who look just like me) on Facebook. …the one who had a girlfriend the entire time we were dating. His girlfriend actually contacted me to find out the details of our relationship. Y’all can see why Tinder-land wasn’t a place I wanted to stay for an extended period of time. Distancing myself from toxic people is okay. In fact, it is necessary for my personal sanity. I don’t owe anyone anything. A man doesn’t deserve a date, an explanation, or a minute of my time just because he decided to speak to me. I shouldn’t settle for just anyone. The man God has for me will be all I need him to be. High standards yield high results. Holding myself to a higher standard (and expecting the same from the men I interact with) will help me weed out the ones who don’t deserve me.